Well, the Christmas season is over. All the presents have been opened, the leftovers are rotting in the fridge and you're most likely still whining about that sweater you've received from your Aunt Bedelia. Now, if you're like me, you've been haunting the Christmas clearance aisles at Target and K-Mart for stuff to prepare for next years Christmas. But, if you're not like me, than you're most likely watching a good horror movie. And today I've got a review of a new independent horror movie. Today's topic of discussion is "NO CLOWNING AROUND". Now, as I pointed out, this movie is a rather short trip into insanity. But a pretty darn good one. 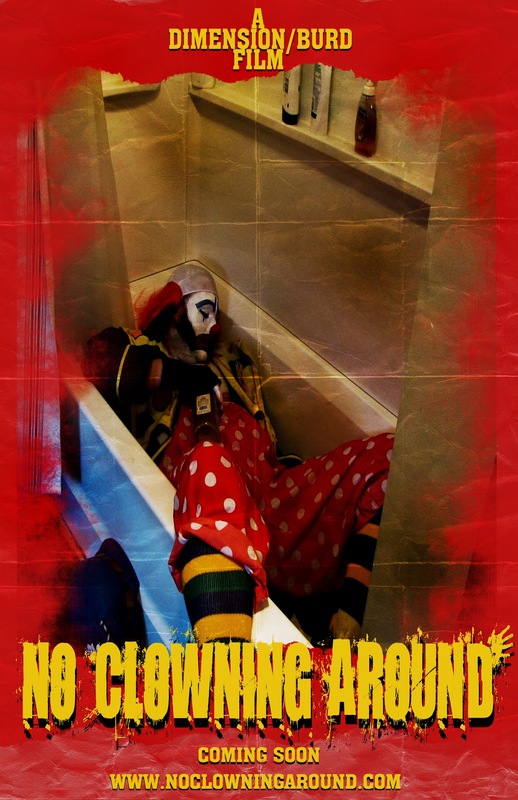 No Clowning Around had to rely heavily on a very low budget and first time actors and director. As far as the acting goes, it's pretty solid all around by all involved. Rob Dimension himself plays Mumbles and does a pretty good job, finidng that insanity and pressure very well. And his conflict with Lenny is a pretty fun aspect of the movie as well. Maybe it's the wrestling fan in me, but I've always said Steve Corino plays an excellent jerk so his role of the bully-like Lenny was the role he was meant to play. Production for a low budget movie, as said by Lloyd Kaufman, can be hell. But, all in all this movie is pretty solid and a very fun watch. For a movie under 30 minutes, it tells a story, gives a good character and ends with us asking "is there more to the story of Mumbles?". I certainly hope we see more from Rob with the story of Mumbles, be it a sequel, prequel or whatever. After watching the movie, I feel this comes off as a throwback to 1980s low budget, straight to vhs movies that we all loved finding on the shelves and took home and became our favorite cult classics. In fact, I dare say this could be a new cult classic just waiting to be discovered. In my honest opinion, I really think that Rob could be onto something. It may be a bold statement, but I think Mumbles could be a major player some day in horror. And that could be something to look forward to. 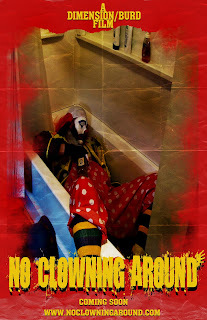 You can find more info on this film, including how to order it at noclowningaround.blogspot.com/ . So, here's to Rob Dimension and his film "No Clowning Around". A great effort and a fun movie to watch!